Second phase of ENPI FLEG Program will be launched in the nearest future. Rosleskhoz, EU and World Bank representative at the opening session of the roundtable. This statement was made by Martin Kaspar, the European Commission’s Program manager at the roundtable “The role of FLEG in the development of the forest sector: the country and regional aspects". 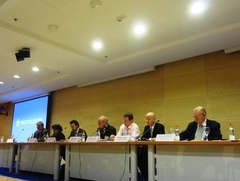 This event was organized by the Russian Federal Forestry Agency (Rosleskhoz) and the World Bank under the financial support of the European Commission / EU in the framework of the 6th “Forest and Man” International forum held in Moscow. Martin Kaspar assured that the European Commission will do its best to accelerate the ENPI FLEG Phase 2 Program activities launch (end of 2012 – beginning 2013). The Roundtable was used as a platform to present information on the EU Policy implementation related to the prepared EU legislation on timber trade. The meeting participants also learned about possible consequences of this policy for the countries which provide timber to the European market. Some time was allocated for the discussion among FLEG focal points from the ENPI FLEG member states (Armenia, Azerbaijan, Belarus, Georgia, Moldova, Russia, Ukraine) on the issues of ENPI FLEG experience integration into National forest policies; practical implementation of the Program results; role and efficiency of ENPI FLEG Phase 1 regional activities; and the dialogue on these topics at the national, regional and global levels. Positive outcomes of ENPI FLEG Program are important in the context of introducing issues of sustainable forest governance as a state priority, reformation of the forestry sector, and developing national forest policies. At the level of each individual country there is a remaining demand in broader range of stakeholders involvement into the processes of diagnostics, improving, investing into institutional development, reliable data collection and monitoring of forestry sector management. In the framework of the Phase 2 of the Program it is expected to continue cooperation with all stakeholders: ministries and agencies, forest businesses, NGOs and common citizens of ENPI countries. Activities will cover such areas as improving law enforcement in the forest sector, forest management efficiency, counteracting and preventing forest fires, illegal logging, expanding and safeguarding rights of local citizens to access to forest resources and information about forests. All these topics are the structural parts of the FLEG process. The overall Program budget allocated by the EU for Phase 2 will be 9 million Euro. These funds will be provided for the implementing organizations (World Bank, WWF and IUCN) for the work in seven participating countries during approximately four years.